Please Note: We do not sell Avery products and are in no way affiliated with Avery-Dennison Corporation. The template numbers referenced within this site are listed to aid in proper software template layout selection in common label software programs. All product names and numbers, logos and trademarks are registered to the respective companies. Most order ship same day / next day. Blank labels sold on this site are prepackaged in unmarked wholesale packages of 250 sheets and some materials require higher minimum orders. Custom printed labels sold on this site require a minimum order of 10 printed sheets. 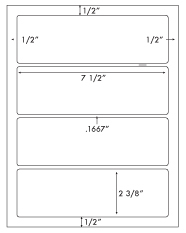 For smaller quantities of blank label sheets, please visit www.labelsbythesheet.com. ©2009 - 2018 www.wholesalelabels.com ; (a div. of Creative Label Concepts). All Rights Reserved. Unauthorized duplication of content, graphics and logos prohibited.